Let us imagine that I am showing you this treasure map. I point out to you all of its details and perhaps even talk a little bit about the exploits of the people who originally found the treasure and where they hid it. I go on to give a history of exactly how this treasure map has survived until today and how it ended up in my possession. 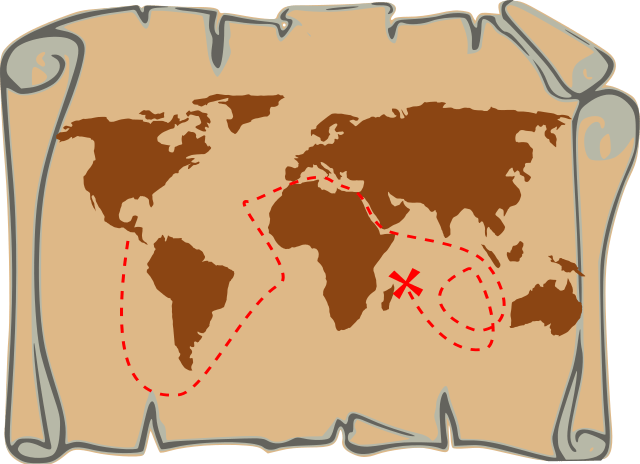 For the sake of argument, let us suggest that I am able to fully convince you that the treasure exists and that no one else knows about its location or existence: the treasure map is completely valid. What would you then want to do? How would you expect to proceed? What if I then simply invited you to attend meetings where a small but dedicated group of people came together to admire the treasure map, explore the map’s origins, consider the quality of the paper on which it was written, and perhaps even argue about details regarding the stories of the people who found the treasure, hid the treasure, and who held the map in secret for generations? In such a situation, what seems to be missing? If the treasure map is valid, the next step would be to go and find the treasure! Christians have a temptation to treat the Bible like we were treating the treasure map as described above. The Bible preserves the greatest message and news for mankind: the good news of the life, death, resurrection, lordship, and eventual return of Jesus of Nazareth (Romans 1:16). The Bible tells the story of how God interacted with His people over many thousands of years. We do well to explore those stories, learn from the examples of the past, and encourage one another in them (Romans 15:3, 1 Corinthians 10:1-12). We even do well to have a good understanding of the story of the transmission of the Biblical text, the discussions surrounding variant readings, and to be able to make a robust defense of the integrity of the text of the Bible as it exists today. Just as a treasure seeker must first be assured that the treasure map is completely valid, so Christians do well to be assured themselves, and to be able to assure others, that the message of the Bible is entirely accurate, legitimate, and valid. It is tempting to focus so entirely on the Bible that we forget its most fundamental truth: the Bible is not an end unto itself. One can admire the Bible, spend one’s whole life and passion in studying and exploring the Bible, and even accept the Bible’s legitimacy, but never get around to actually seeking after the God who has revealed Himself in the Bible. Such a one is like the person described above who is so infatuated with the treasure map that he never gets around to finding the treasure. Such a one has entirely missed the point! Those who wrote the Bible understood its proper place. John wrote about the life of Jesus not to have his narrative admired or his rhetoric praised but so that those who heard would believe that Jesus is the Christ, and by believing have life in His name (John 20:30-31). Paul affirmed the value of Scripture to give hope to Christians and to equip Christians for every good work (Romans 15:3, 2 Timothy 3:15-17). They understood that the power of the message was in the One to whom it pointed. The message is powerful because it represents the message of our Creator God to us; it demands that we put our trust in God in Christ and to follow His way (1 John 2:3-6). Thus, just as the point of a treasure map is to direct people to find the treasure, so the point of the Bible is to direct us to God as He is revealed in Jesus Christ (Hebrews 1:1-3). Everything said in Scripture depends on the existence of God as the Creator and of Jesus as the Son of God made flesh, raised from the dead, and serving as Lord (Acts 2:14-36, 1 Corinthians 15:1-58). If the Bible had been perfectly preserved but Jesus had never actually lived, died, or was raised, then the Bible has no more or less value than the mythological stories of the ancient Near East. We may find Jesus’ ethical declarations to be compelling, but if He does not actually exist, or if He were not raised from the dead, then they serve as the ravings of a charlatan or a madman. Let none be deceived: the Bible is a resource of great value, for in it we hear the messages God has given through the prophets, Jesus, and the Apostles. But the message is not an end unto itself; the message points us to believe in God and in His Son Jesus and to do what He has said. The Bible provides the basis of faith, but we must actually have that faith that God has done in Christ according to all the prophets and Apostles have testified (1 Peter 1:10-12). Thus we must have faith in God in Christ based on what He has revealed in Scripture; our faith cannot be in the Bible itself, for the Bible is not God. Just as it is folly to be so infatuated with a treasure map that one never searches for the treasure, so it is to invest in the Bible without reference to the God who made it known. May we put our trust in God in Christ based on what He revealed in Scripture, and give Him all glory and praise!